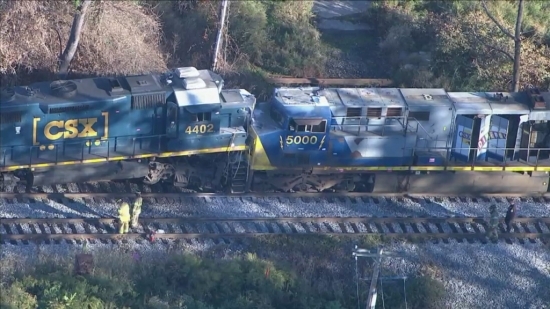 Two CSX freight trains collided this morning in Chester, Delaware County. It happened at 8:25 a.m. at a track interlocking between Kerlin Street and Concord Road. The two trains hit head-on. One was traveling from Richmond, Virginia to Pavonia, New Jersey with three locomotives and 64 empty freight cars. The other was traveling from Quebec, Canada to Atlanta, Georgia, with one locomotive and eight intermodal cars carrying consumer goods and food products. Each train had two crew members aboard. CSX says that two employees were taken to the hospital but did not release details on their condition. There were no hazardous materials involved in the crash, but there was a diesel fuel spill. Why the two trains were on the same track and cause of the crash is under investigation. The Philadelphia 76ers have issued an apology today after not allowing R&B singer Seyvn Streeter to perform the National Anthem at Wednesday's home opener at the Wells Fargo Center because of her wardrobe. Streeter was about to take the court to sing when she was told that she could not wear her "We Matter" jersey. She was offered an alternative, but she declined. Streeter posted a short video message to Twitter that night saying what happened. Today's statement reads: "We are sorry that this happened. After receiving feedback from our players, basketball operations staff and ownership group, we believe that the wrong decision was made, and Seyvn should have been welcomed to sing. We apologize to her, and in an effort to move the conversation forward, we have reached out to offer her an opportunity to return and perform at a game of her choice. We are waiting to hear back." The Pennsylvania Turnpike is closed in both directions due to downed power lines. The closure is between the Delaware Valley and Bensalem interchanges in Bristol Township. A dump truck raised its bed and got entangled in the wires. The Turnpike Commission is detouring some trapped motorists off of the turnpike on to local roads and then back to the Turnpike using its Plan X protocol. There have been no reported injuries. Montgomery County 911 landline service has been fully restored as of 5:18 a.m. Friday. Service was interrupted for some customers starting around 2 p.m. Thursday after a contractor in Wayne cut a cable containing communication lines. Callers using a landline would have gotten a busy signal. Cellular service was not affected. Officials are not aware of any incidents where someone's safety was compromised.